The UVa basketball team will take on Gardner-Webb in the first round of the NCAA Tournament. The Runnin' Bulldogs will be making their first-ever appearance in the Big Dance. COLUMBIA, SC - The Virginia basketball team had an hour-long practice Thursday at Colonial Life Arena in Columbia, South Carolina preparing, for its first round game in the NCAA tournament. The top-seeded Cavaliers will face 16-seed Gardner-Webb Friday at about 3 o&apos;clock. "You want to play free," says UVa junior guard Kyle Guy. "You want to have a sense of joy and fun when you&apos;re playing the game. Also, when you step on the court it&apos;s business time. There&apos;s a level of focus we have to have and preparation today that we&apos;re looking forward to." The Runnin&apos; Bulldogs were staying loose with hooded sweatshirts on the practice court, and playing cards in the locker room. "We&apos;re excited," says GWU sophomore point guard Jaheam Cornwall. "We&apos;re eager to get out there on the floor, and ready to compete. March Madness, anything can happen. We&apos;re just here to make the best of it, and see how far we can get in this tournament. Gardner-Webb will be making its first-ever appearance in the NCAA tournament. "I&apos;ve heard about (the tournament), as a kid," says GWU senior forward DJ Laster. "Always dreamed about it, but now that I&apos;m here, it just feels good. We&apos;re not the biggest team, we&apos;re not the strongest team, but we just have that heart." The Bulldogs know the history made by the Cavaliers in the 16 vs 1 matchup last season, but they&apos;re not focused on it. Cornwall says, "Last year they lost to the #16 team. We&apos;re not worried about that. We&apos;re worried about who we are, and what we can do to stop them from walking out of there with a win." UVa junior guard Ty Jerome says, "Last year, we discussed it a lot. We use it as motivation. It can take you to a place you&apos;ve never been, if you use it the right way. It&apos;s more about doing what we do, playing with the same edge every single game that we&apos;ve played with this year rather than we have to make up for last year and playing with anxiousness and anger." 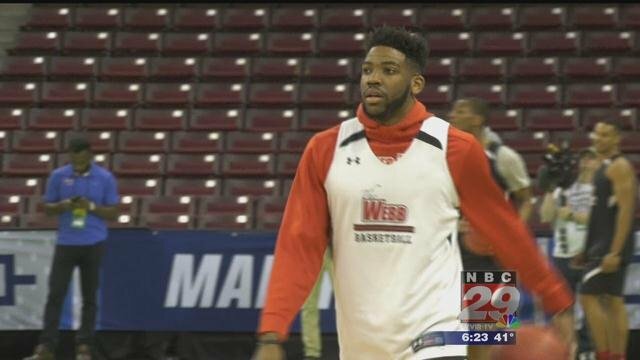 "We&apos;re not UMBC, we&apos;re Gardner-Webb," says Laster. "We&apos;re just going to go out there and play the same way we play, and be able to compete with them, and play at the highest level." Gardner-Webb has played at the highest level this season, going 2-1 against teams from the ACC in non-conference play. GWU senior guard David Efianayi says, "It just gives us confidence that we can go out there and compete and get the &apos;W&apos; if we play together." Cornwall adds, "Our confidence comes from the beginning of the season, getting two ACC wins, battling against those high major teams, and coming out with a win, and sticking together through tough crowds. Places like this, that can get really loud." It might be getting loud in Gardner-Webb&apos;s favor. Their campus is located just two-hours away in Boiling Springs, North Carolina, making it an easy trip for Bulldog fans. Efianayi says, "They&apos;re the reason why we were undefeated at home. The community is for sure going to be out there celebrating for us. They&apos;ll just give us the extra energy to compete at the highest level." Virginia and Gardner-Webb are scheduled to tip-off about 3 o&apos;clock Friday in the NCAA tournament.